Baseball is often used to define fatherhood, and fatherhood is often used to define baseball. Somewhere it was said that baseball is fathers playing catch with sons, or something like that (I don’t know if he coined the phrase, but the great poet—and Dock Ellis collaborator—Donald Hall wrote a book of essays about sports using that title). Feeding into that notion is the familial bond strengthened and even defined through a shared love of the game, the game being passed down from generation to generation, and, last but not least, the literal act of fathers playing catch with sons, an act perhaps as sacramental as any other in secular America. What above that would a new father think of when imagining his relationship with his son? What else could more firmly lock father and son together and lock them both to the most tender and joyful element in the myth of the nation? This notion of fathers playing catch with sons has become an epicenter of sentimentality, too, a way toward weeping hot, nostalgic tears for, depending on the weeper, the distance in time from such a catch, the absence of such a catch, the absence, in part or in full, of the father. This is the myth of the land, too: the absent father, the catch that never was. The second time I saw Field of Dreams I wasn’t having any of this, rejecting it as I would the idea of eating a bucket of sugar. By the time of the climactic catch between father and son, I had already come to this conclusion about and rejection of the movie, and Costner’s phrasing—“have a catch”—put me over the top. I’d never to that point heard of the act of throwing a ball back and forth as “having” a catch, and the term made the act sound all the more precious and sentimental, almost unbearably childish, even though the term my brother and I used when we wanted to do throw a ball around, if we had to use one at all beyond just eye contact and the waggle of a glove—“play catch”—was also childlike. I don’t know, “playing catch” just sounds, still sounds, less like a big production with swelling orchestral strings than “having a catch.” I understand now that it’s probably just a regional thing—in some places this is just what people say when they want to throw a ball back and forth. (But, still, I for one will never use the phrase “have a catch.”) Anyway, that second viewing of Field of Dreams formed my official stance on the movie, but I must admit that my first viewing of the movie went much differently. I first saw it on an airplane over the Pacific Ocean. I was at one of the more vulnerable moments of my life, as I was on my way to spend a few months in China with the idea that I would study there, but I had no real plan beyond the notion that I was going to meet up with my college writing professor, who was teaching there for a year, and together we would “figure something out.” I had never left the continent before, and I didn’t know a single word of Chinese or anything about Chinese culture. It was a leap into the unknown. And here, during the longest flight of my life, into this unknown, came a soothing story about baseball and the American Dream and fathers playing catch with sons, and I fell into it completely, desperately, and at the end, during the “have a catch” scene, I started to lose it. I was sitting next to a young Japanese guy, and he was starting to lose it, too, and the two of us turned to one another and grinned sheepishly. Japanese guy: It is nice. So, let’s face it, I’m as deeply snared as anyone in the myth of baseball and America and fathers “having” catches with sons. Now that I’m a father I have already thought repeatedly about such a catch with my own son, even though his command of his hands and limbs is minimal, but it is not nonexistent, and he is able to grip onto my finger, which has more than once made me feel choked up. Anyway, it’s a long way off. In the meantime, however, everything but everything, or so I’ve been told, maybe not in so many words, is fathers playing catch with sons, and in this my role is to be a catcher. I have to catch what he throws. I have to be there. I have to be sturdy and balanced and relaxed but ready. 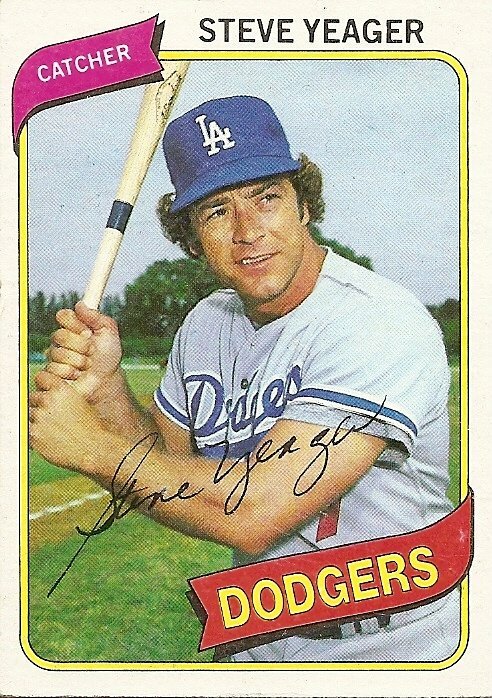 Like Steve Yeager in this 1977 card, an impossible ideal of relaxed readiness, the supreme catcher. Whenever you’re ready, Yeager seems to be saying. I can crouch here all day. Whenever you’re ready, I’ll be here. 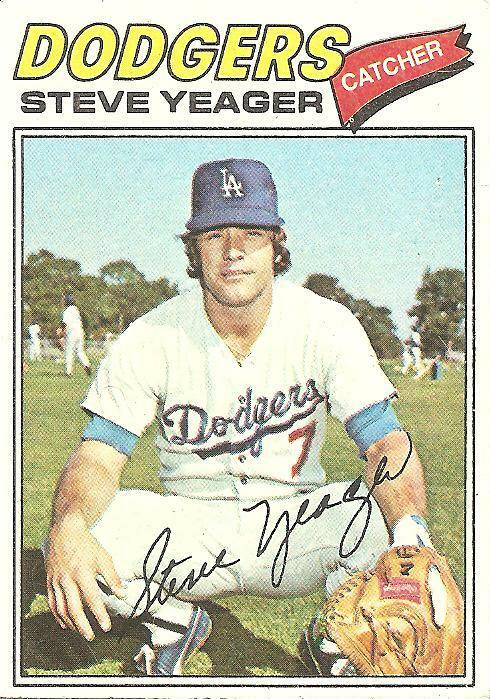 You are currently browsing the archives for the Steve Yeager category.